IXS makes some fantastic protective wear – I’ve been riding in their Dagger knee guards this summer, which are hands down my favorite knee pads for downhilling. 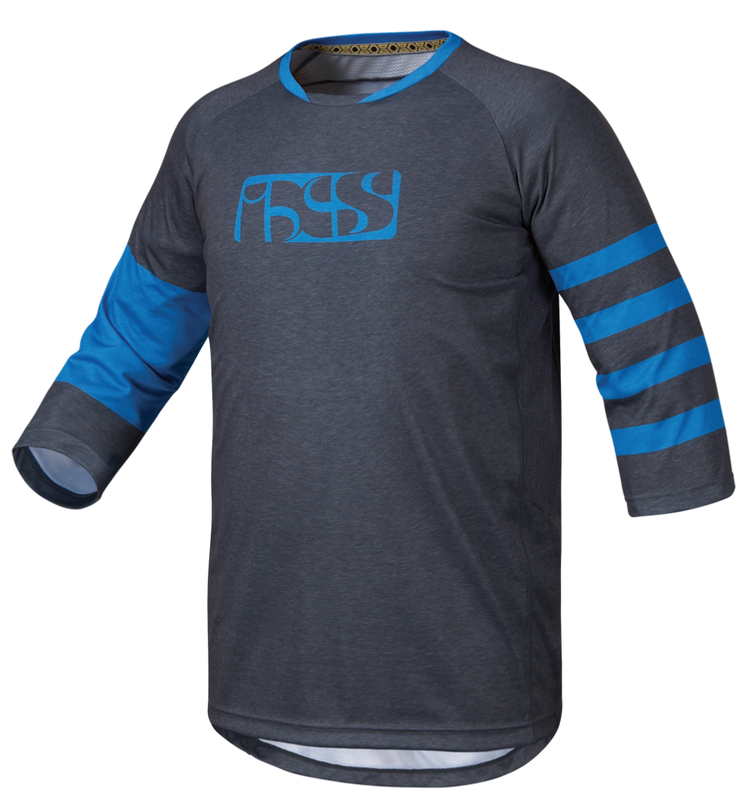 And lest I be judged by the gromlets in the lift line, I can round out the kit with some of IXS’ good looking apparel. 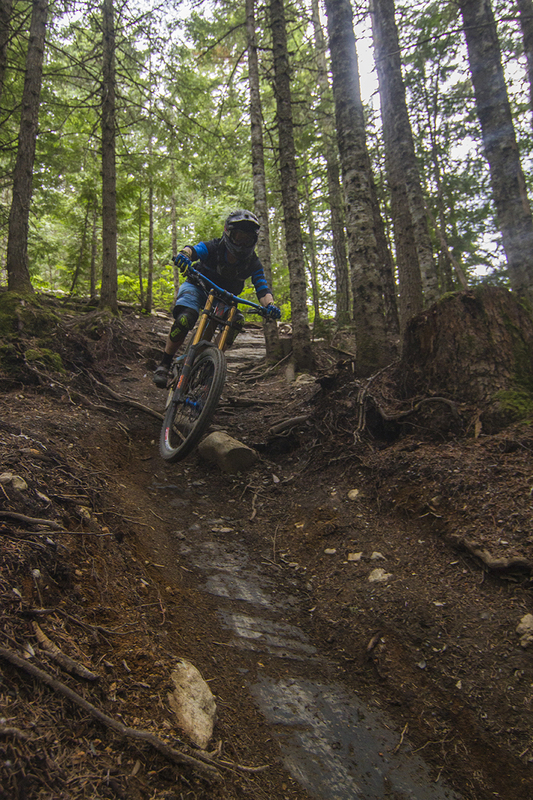 I’ve been spending time both in the bike park and on the trail bike in the IXS Sever 6.1 BC shorts and the Vibe 6.2 BC jersey – here’s how they did. The Sever shorts are made out a mid-weight, 4-way stretch fabric. The fabric isn’t heavy in the “winter riding gear” sense, but it definitely holds its form better than some of the super lightweight fabrics that you’ll sometimes find in other shorts. That said, the Sever’s fabric never feels stiff or crinkly. The Sever shorts don’t have any zippered vents, but the fabric on the inner thigh is perforated to allow a little more airflow. For pedally rides, I’d say the Sever shorts run a little warmer than average. In cooler temps (below 75°F or so) I didn’t notice this to be an issue, but if you tend to run hot, or if you live in a very warm climate, these shorts wouldn’t be my first choice. 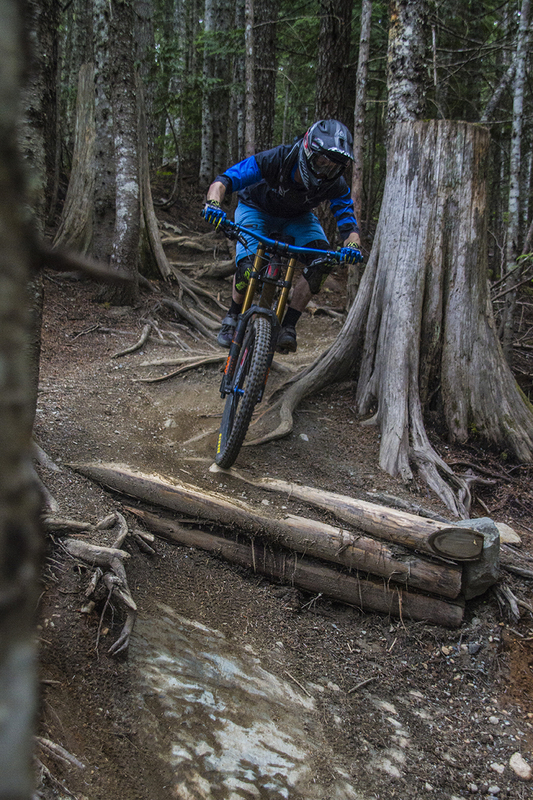 Noah Bodman in the IXS Sever Shorts and Vibe Jersey, Whistler, BC. The Sever shorts have 4 pockets, all of which are zippered. Two hip pockets and two thigh pockets work well to hold all of my assorted crap (keys, phone, multi-tool, gummi bears), and partitions in the thigh pockets help keep things from banging around while pedaling. 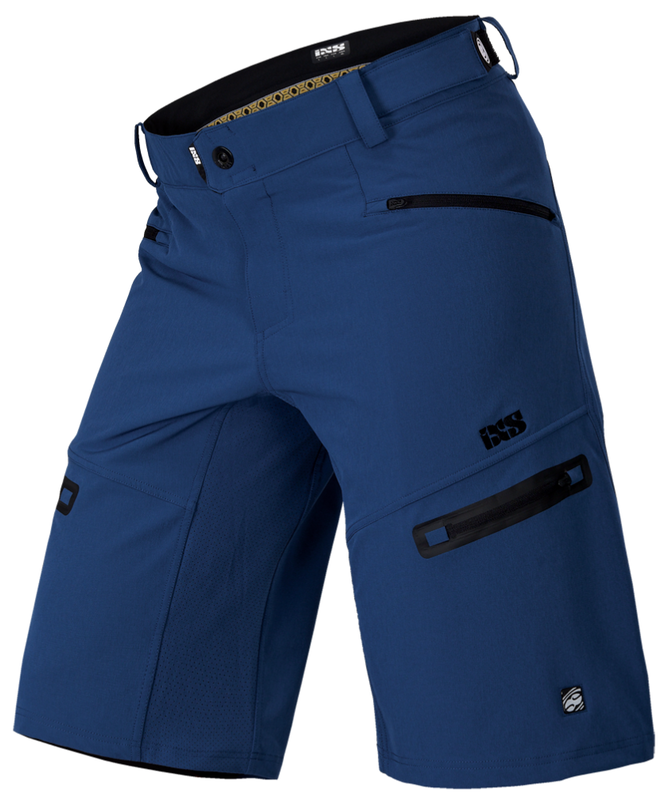 While IXS does have some shorts that include a liner / chamois, the Sever short doesn’t include one. I haven’t spent time in IXS’ liners, so I can’t comment on those. The Sever shorts have an elastic / velcro waist adjustment system, similar to a lot of shorts on the market. On the Sever shorts, this adjustment pulls from the front to the back, which is opposite from a lot of shorts, but it seems to more or less have the same end result. The closure on the front is a combination of snap buttons, velcro, and zippers – no complaints there, although I am slightly partial to a button closure instead of snaps. Overall, fit is true to size. I wear a Medium in pretty much everything, and my medium Sever shorts fit well. The only noteworthy aspect of the Sever shorts is the inseam – at around 13” on the size Medium, it’s a bit shorter than many other baggies. It’s still long enough that I don’t feel like I’m showing an immodest amount of thigh, but tall people should take note. The bottom of the shorts flairs out a little bit, so the shorts fit over pads just fine. Due to the short-ish length though, I sometimes got a bit of a gaper gap between my shorts and knee pads. You know how some garments just kind of feel nice? They have a certain weight to them, and the cut and finish is particularly clean? The Sever shorts fall into that category – they just feel well made. Given my druthers, I’d add a DWR coating and I’d make the inseam a touch longer, but they’ll likely fit people with shorter legs really well. All in all, the Sever short is a great short that works well for running laps on the chairlift or pedaling trails in the backcountry. Like the Sever shorts, the Vibe jersey feels high quality. The fabric is a little heavier, and it’s super soft and comfortable. It’s cut pretty long, so there’s a good amount of overlap with the shorts. I also think this means it’d work well for the tall / skinny crowd – the jersey isn’t particularly baggy on my 5’9”, 155lb frame, but it’s longer than most other jerseys in my closet. At least for my personal preferences, IXS nailed the cut on this jersey. Everything is right – it’s loose without feeling excessively baggy, the neck isn’t too loose or too tight, the sleeves hang loose without flapping in the wind, etc. It’s not that I’m overly picky about jerseys, but it’s a rare jersey where I can’t find some aspect of the cut that’s a little weird. The fit on the Vibe jersey is perfect. The Vibe jersey also has a sunglasses wipe on the inside of the bottom hem, which is a feature that every jersey should have – I use it all the time. As far as the looks of the jersey go, you can judge for yourself – the pictures accurately show what it looks like. Personally, I like it; understated, with just enough color so that you don’t look like you’re an odd mash-up of mountain bikes and goth. The Vibe jersey fits very well, and it’s a really nicely made jersey. It’s a little heavier, so it runs a little hotter than some of the super lightweight mesh jerseys, but particularly for DH laps, the Vibe jersey is fantastic. If I’m heading out with the DH bike, this is my favorite jersey in the closet.